JERUSALEM -- An Israeli man stabbed four Arabs in the south of the country Friday morning and a Palestinian later stabbed a 14-year-old Israeli in Jerusalem police said, as spiking tensions in Jerusalem and the West Bank threatened to spread throughout Israel. Police spokeswoman Luba Samri said two members of the country's Bedouin minority and two Palestinians were wounded in the attack in the city of Dimona. The men were evacuated to a hospital for treatment. Samri said attacks were likely "nationalistically" motivated. Israeli media reported the stabber said after his arrest that he carried out the attacks in retaliation for the numerous Palestinian attacks on Israelis this week. Dimona mayor Beni Bitton said the stabber is a "mentally ill man." He told Channel 10 TV that two of the victims worked for City Hall, and that passers-by quickly rushed to help the wounded Arabs and provided first aid. Prime Minister Benjamin Netanyahu "strongly condemned the harming of innocent Arabs." He said whoever deploys violence will be brought to justice. Israeli security forces braced themselves for more unrest Friday after days of Palestinian attacks that spread this week from beyond the flashpoint of violence at Jerusalem's holiest site and across the West Bank to Israeli cities. The age limit has been set intermittently in an attempt to ensure peace at the site, as it's mostly younger Palestinians involved in the violence. The attacks were initially confined to east Jerusalem, site of the sacred compound, and the West Bank - both territories captured by Israel from Jordan in the 1967 war and claimed by the Palestinians for their future state. But this past week the violence has spread to Tel Aviv, Afula and other Israeli cities. Prime Minister Benjamin Netanyahu has called the attacks a "terror wave." 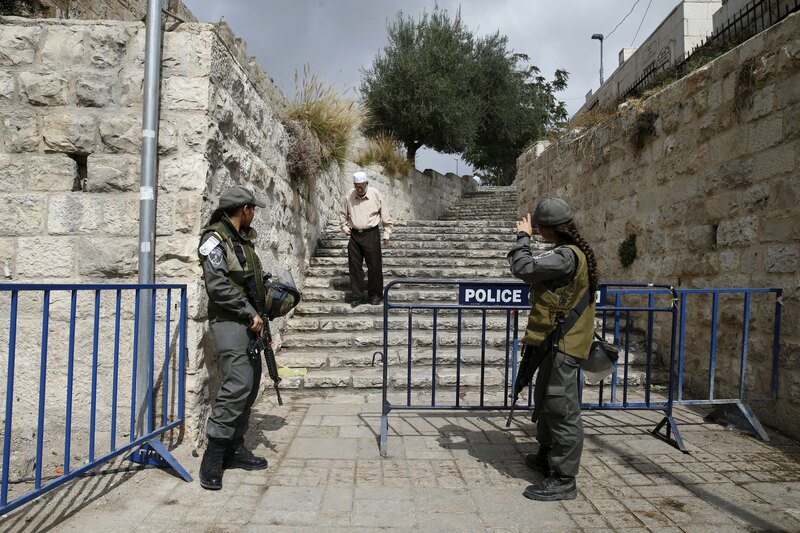 Israel has significantly beefed up security in response to the violence in Jerusalem, and on Thursday police set up metal detectors at the entrance to Israel's Old City. But Palestinians say that in the last two months, there has been a new development where Israel has intermittently restricted some Muslims from the compound when Jews visit. Israel says this is to reduce friction, but Palestinians claim that Israel intends to establish Muslim-free Jewish visiting hours. The site is so sensitive that even rumors are enough to trigger violence there.